Dancing can be a powerful form of expression, or just a way to let loose when nobody’s watching. 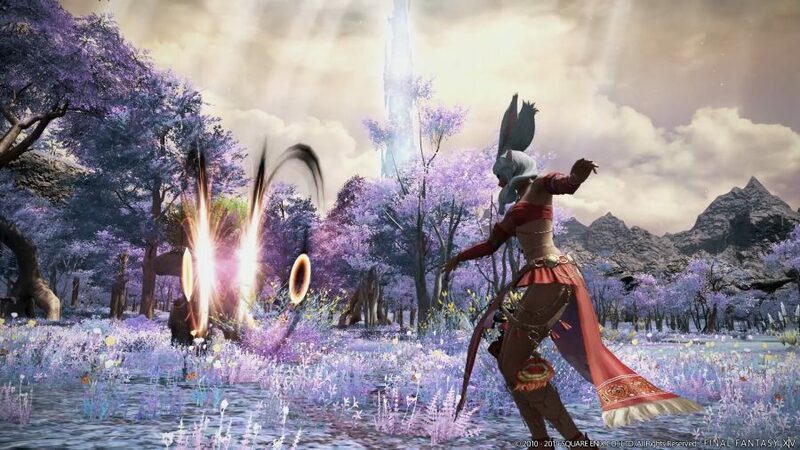 However, Final Fantasy XIV’s Dancer is rather different: this new Shadowbringers job is all about dishing out damage from afar and cheering on your allies with some inspiring moves. The new FFXIV job was announced at Tokyo Fan Fest 2019, where we were lucky enough to get a closer look at more of the new features and content coming when the FFXIV: Shadowbringers release date arrives. The Dancer will be the second new FFXIV job to come with Shadowbringers, following the already-revealed FFXIV Gunbreaker job. Dancer will fulfil the Ranged DPS role, though it also offers some support skills. It will dual-wield two chakrams as its weapon of choice and it will most likely share ‘aiming’ gear alongside the Bard and Machinist jobs. Now, though, it’s time to hit the dancefloor and round up everything you need to know about the upcoming Dancer job in Final Fantasy XIV. Based on what’s been announced so far, we have an overview of the new job’s abilities, a guide on how the Dancer job fits in the Final Fantasy canon. Let’s boogie! Following FFXIV Fan Fest in Tokyo, we now know that you will be able to acquire the Dancer job by visiting a trainer in the starting city of Limsa Lominsa. You’ll need to have at least one Disciple of War or Disciple of Magic job at level 60 in order to start the quest, however. It is not yet known which NPC will serve as your trainer throughout your job quests. Whoever this person turns out to be, they will offer you some initial guidance on how to play Dancer, provide you with a weapon, and give you a set of armour to get you throwing your first set of shapes. No Dancer skills have been revealed yet, so we can only speculate based on the Dancer reveal trailer that debuted at Tokyo Fan Fest in March. While by no means conclusive, it does offer up some clues as to how you’ll dance your way through battle in the upcoming expansion. Something clear from the trailer is the balance of damage dealing and support skills to which the Dancer will have access. Many fans expected Square Enix to announce a new healer class for Shadowbringers, but instead we appear to be receiving something closer to a Bard – a ranged DPS who can also buff their allies. Dancer can also be seen flinging chakrams at enemies from all angles and catching them like a pair of sharp boomerangs with ease. Some of these attacks leave the chakram in place as they carve further into enemies – perhaps they will serve as combo finishers. In terms of support abilities, we can see Dancer twirling in a flash of colour to activate – what we assume – are buffs or auras. It’s hard to say exactly what they do, but, going by the red tinge on the last one performed, that could suggest some form of attack speed or attack damage buff for herself and her party. We expect something very similar based on the current party-wide buffs in Final Fantasy XIV. Also, the Dancer will have access to a number of Ranged DPS role actions. The more popular choices in the game right now – such as Invigorate and Tactician – may no longer be available in Shadowbringers as TP merges with MP to become a single resource. Nevertheless, damage reduction skills such as Palisade and the MP regeneration from Refresh will likely keep them as top choices considering their party-supporting properties. Dancer has a rich history across the series since its first appearance in Final Fantasy V. Then it was a fairly weak melee job better suited to casting magical abilities and performing one of four random dances that offered a range of effects, from confusing enemies to draining their HP. The job was more prominent in Final Fantasy X-2, though it existed under the name of Songstress in the 2003 sequel. By dancing or singing, the Songstress could apply different buffs to allies or nerfs to enemies, though it was unable to perform attacks itself. Perhaps the most important version of the job in an MMO context is Dancer’s appearance in Final Fantasy XI. When the job was first rumoured to be coming to Final Fantasy XIV, its history as a support and healer led many to think that would be the same for Shadowbringers. Their competency at fighting, however, allows FFXIV Dancers to fulfil a damage and support role. While tanks lick their lips at the prospect of playing as a Gunbreaker, healers must make do with White Mage, Scholar, and Astrologian for now. According to game director, Naoki Yoshida, the team would prefer to work on balancing the current healer roles instead of adding a new one.